You pick up two IPAs at your local bottle shop. One boasts that it’s “dry-hopped.” The other proclaims itself “wet-hopped.” What’s the difference? And is one going to taste better than the other? As the Pacific Northwest’s hop-harvest season wraps up and releases its explosion of wet-hopped IPAs, friends have been asking me what exactly these terms mean for what’s in their glass. When brewers are making a batch of beer, they can add hops—the flower cones of the humulus lupulus plant—at different stages in the process, depending on what they want to achieve in terms of flavor, aroma, and bitterness. Hops are delightful little plants that contain oils and other organic compounds that impact the flavor of beer, but those oils and compounds express themselves differently depending on when they’re introduced to beer. The first time hops enter the process is when wort (unfermented beer) is being brought to a boil inside the brew kettle. A brewer will add the first load of hops, which, when added to boiling water, undergo isomerization. Basically, the process of isomerization turns hops’ alpha acids into water-soluble, bitter compounds. This is the point at which hops add that bitter bite to beer. Dry-hopped IPAs are all the rage now because in the past few years, drinkers have come to demand more hop aroma and flavor with less emphasis on hop bitterness. Remember all those extremely bitter, “palate-wrecking” IPAs of the mid-2000s? They’re pretty much passé now, as more consumers focus on the fruity, tropical, wine-like, candy-like aspects of hops. So if you’re a fan of IPAs that smell like candy peach rings (I mean that in the best way possible), then dry-hopping might be a term you want to look out for. When we talk about wet-hopping, we’re not talking about when the hops are added to the brewing process. Instead, we’re concentrating on the form of hops used to brew a particular beer. 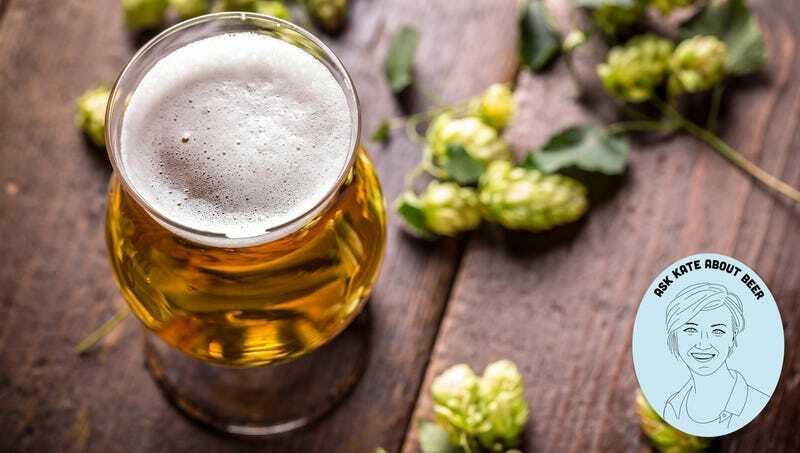 Hops can come in a few formats: whole dried cones, pellets made from these cones (the most common form), and hop oil, which is made by extracting compounds in hops and distilling them into a concentrated liquid. Wet-hopped beers—also called fresh-hop or harvest beers—are made with whole-cone, un-kilned (not dried) hops. The vast majority of commercially grown hops are harvested in August and September and then dried; after all, brewers make beers year-round, not just when the hops are fresh-picked. Dried hops are processed and dried as quickly as possible after harvest, and are turned into pellets that are kept in cold storage or even freezers. While hops can last a remarkably long time under good conditions (years, even), there’s nothing quite like fresh-from-the-field hops, which have retained all their volatile and delicate aroma and flavor compounds. Because they’re brewed days if not mere hours after a hop harvest, wet-hopped beers are a seasonal treat. You’ll see them crop up in the early fall, and then it’s another 11 months before they’ll return. The hop expression in most of these IPAs is, frankly, intense—think of the difference between dried garlic powder and fresh-chopped garlic, as an analogy. My favorite thing about wet-hopped IPAs though isn’t necessarily that they’re better than IPAs made at any other time of year, it’s that they remind me beer is an agricultural product. Like cooking, ingredients matter to brewing. And when they’re fresh-from-the-field, there’s nothing quite like them.